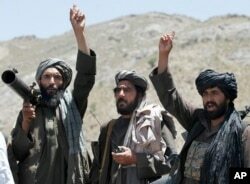 The Afghan Taliban will join multilateral peace talks hosted by Russia on Friday, senior Taliban officials said Tuesday, after the United States and Afghanistan turned down their invitations. FILE - Taliban fighters react to a speech by their senior leader in the Shindand district of Herat province, Afghanistan. A five-member Taliban delegation led by Sher Mohammad Abbas Stanakzai, head of the Taliban's political council in Qatar, will attend. "The majority of our top leaders showed the willingness to participate in the Moscow peace talks, though some of them also expressed their reservations and said it would not give them any benefit on the ground in Afghanistan," said a Taliban member. Some members of the Taliban said the delegation would raise their demands for a withdrawal of all foreign forces, the release of all prisoners and the lifting of a ban on travel. "This is a very good opportunity and we would like to participate and raise our genuine issues," said another Taliban official. "We would urge these world powers to help resolve the Afghan issue as per international laws and principles." "We have been clear that no government, including Russia, can be a substitute for the Afghan government in direct negotiations with the Taliban," the U.S. official told Reuters.